U.S. National Security Adviser John Bolton, left, and Russian Security Council chairman Nikolai Patrushev pose for a photo prior their official talks in Moscow, Russia, Oct. 22, 2018. U.S. National Security Adviser John Bolton has hinted that a key arms control pact with Russia may have run its course. Bolton meets in Moscow Tuesday with President Vladimir Putin to explain why President Donald Trump wants to pull the U.S. out of the 1987 Intermediate-Range Nuclear Forces Treaty. Trump has accused Russia of violating the agreement. "We don't think that withdrawal from the treaty is what causes the problem. We think it's what Russia has been doing in violation of the treaty that's the problem," Bolton told Russia's Kommersant newspaper. "You can't bring someone in compliance who does not think they are in breach." Bolton said he believes Cold War-era bilateral treaties are no longer relevant because of today's global security environment, where other countries are also building missiles. 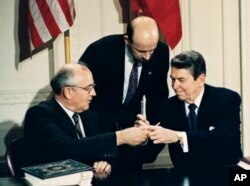 Former Soviet leader Mikhail Gorbachev and the late U.S. President Ronald Reagan signed the INF accord in 1987. It bans the United States and Russia from building, testing, and stockpiling ground-launched nuclear missiles with a range from 500 to 5,000 kilometers. ​Trump said the U.S. would have to start developing new weapons if Russia and China — which is not part of the INF treaty — do. Russia denies violating the agreement and says it is U.S. missile defense systems in Europe that are in violation. A Putin spokesman says a U.S. pullout from the INF treaty would make the world a more dangerous place. He said Russia would have to take security countermeasures to "restore balance." Russian National Security Council chief Nikolai Patrushev said after his talks Monday with Bolton that Russia is willing to talk with the U.S. about the mutual complaints against one another in a bid to salvage the INF pact. A Russian statement also said Monday Bolton and Patrushev discussed a possible five-year extension of another arms control agreement, the Strategic Arms Reduction Treaty. That deal took effect in 2011 and is set to expire in 2021.